Erik Marthaler (@erikmarthaler) is a Chicago-based street and urban landscape photographer who enjoys wandering the Windy City and capturing its sites. With the brutal winters that Chicago tends to endure (there’s a reason they call it Chiberia), there’s a little extra preparation involved with keeping yourself safe and warm. For Erik, it mostly involves plenty of layers and hand warmers, but the gear he chooses to bring needs to withstand the elements too. Photographically, Erik’s kit is pretty lean. He primarily works with a single Sony full-frame mirrorless body, a fast G Master prime and a wide-zoom. 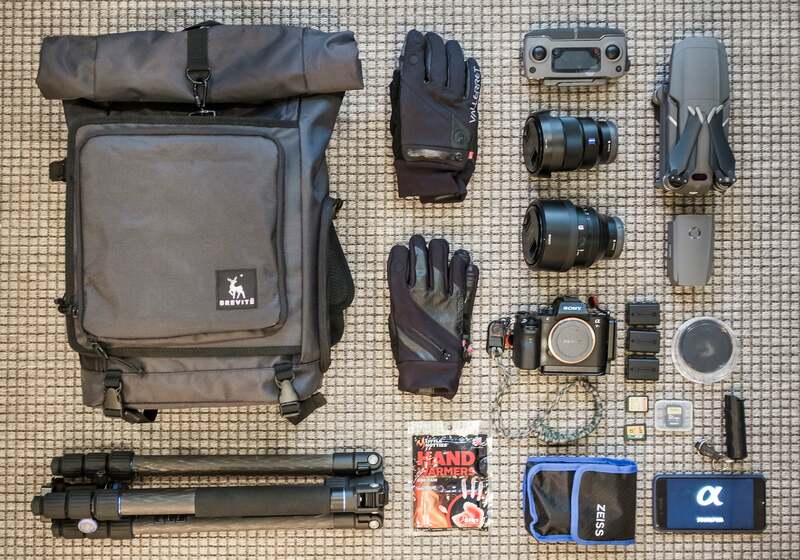 We spoke with Erik to learn more about the gear he packs and how he uses it when he ventures out to capture the city of Chicago in brutal winter temperatures. This is one of my favorite lenses for both street photography and urban landscape. It’s super light and not too obtrusive…it’s definitely my go-to lens when I want to do long exposure of a sunrise coming over the city. Sony α7R II: While I’m shooting street and urban landscape scenes, this is my camera of choice. I have used other brands in the past, but I am in love with the 42mp, full frame, uber-quick sensor. I love the fact that the body is lightweight and has a comfortable hand grip so I can walk around the city without having to take it out of my hands. I added a wrist strap and Peak Design clips for added security. Also, with the different types of weather and temperature changes that Chicago has, it does really well with rain or shine, heat or cold. When shooting street, I love to switch my manual focus over to continuous auto focus when trying to capture people moving around quickly. And when shooting city landscape, it is nice to have the option to bring my ISO down to 50 to keep it dark and moody, especially during sunrise. I also know that I can shoot a scene a stop or two down, or a little dark on purpose, and feel confident that in post-production, I can bring back those highlights and shadows and still have a clean image. The flip screen on the back of the camera is great when I need to get a different angle on one of my subjects and one can’t argue with the stellar SteadyShot system this camera has inside either. Sony 85mm f/1.4 G Master: This lens is a beast. Just by holding it, I gets a sense of the quality by the weight of the glass and feel of the construction. Although this lens is typically used for portrait work for most photographers, it’s a daily driver for me, especially when trying to capture city life. Most would say that a street photographer should have a less obtrusive lens and be more discreet, but I love the fact that I can get a shot from across the street of a subject and know for a fact that in post-production I can crop in and still get a super crisp image. A lot of times while shooting in the city, light has a hard time penetrating through the tall buildings. That’s where the low aperture comes in handy, especially when I want to have some nice bokeh in the background of my image. Sony Vario-Tessar T* 16-35mm f/4 lens: This is one of my favorite lenses for both street photography and urban landscape. It gives me a nice variety of options when trying to capture a whole scene or not, which is important to me. It’s super light to carry around the city and not too obtrusive so I can sneak in a couple of photos of people on the streets or through a window drinking coffee for instance. It’s definitely my go-to lens when I want to do long exposure of a sunrise coming over the city. Brevite Magnetic Roller Top Camera Bag: This is a great bag to make it look like you’re not a photographer with a bunch of expensive gear being carried on your back, especially when you are in the city. I also like this bag because there is plenty of room for extra clothing, like a hoodie in the winter, my drone, or even my laptop if I decide to take it to a coffee shop and do some editing there. It also has a handy side pocket for easy accessibility to my camera or a lens if I don’t want to dig through the whole bag for them. Benro Travel Angel Series 2 Carbon Fiber Tripod with V1E and L Bracket: This is a lightweight and super durable tripod, which I like to bring along with me if I know I am going to be doing long exposure, sunset or sunrise photos. Especially here in Chicago along the lake, it is vitally important to have a tripod that will hold up and be steady with our winds. I also like this tripod because of the different heights I can get. The L bracket is a game changer when I want to keep the frame the exact same, but just quickly change up the photo from a vertical to a horizontal layout, and back. Extra batteries. I always keep at least three batteries on me at all times. It’s when you don’t have extra batteries that you had forgotten to charge the one in your camera the night before, or it’s bitter cold out and the battery drains quicker than normal. Extra SD Cards: I carry a variety of SD cards including a Sony TOUGH 300MB/s 32 GB. It’s like having insurance, you never know when you’re going to need it. If something happens to one of them or I fill up one of them, I always have backup. You never know when a friend might need one as well. Hoya Variable Density 10 Stop Filter: This is great to have during sunrise and sunset when I want to get a slightly moodier image than I would get by just editing it in post-production. It allows me to use a different array of shutter speeds and aperture settings that I wouldn’t normally be able to use without it. Cleaning Kit: This is a handy little kit to keep sensors and lenses free of dust and spots. It comes with a cleaning spray, cloth, blower and soft brush. Mavic Pro 2 Drone and Controller: Although there aren’t many places in the city to fly a drone, I always like to have it on hand in case I am in a legal area to capture the city. I also have two batteries in case one dies quickly. Vallerret Photography Gloves: These are a must in the winter months here in Chicago. I have both the thinner Markhof and thicker Inspoot gloves with merino interior to keep my hands warm. They both have an index finger and thumb magnetic fold back option so you aren’t fumbling around with your camera buttons with thick gloves on. I also like that they have zipper pockets so I can stuff hand warmers or an extra SD card into them. Little Hotties Hand Warmers: Another must-have in the frigid Chicago winter! I put them in my gloves, my inside coat pockets along with my extra camera batteries to keep them warm, and I even put them in my camera bag to keep my gear warm and drone batteries warm as well. iPhone and Charger: It’s an essential part of my every day routine. Pepper Spray: I know what some of you may be thinking, but it’s better to have a little sense of security when roaming around the city with expensive gear, especially when I am alone.